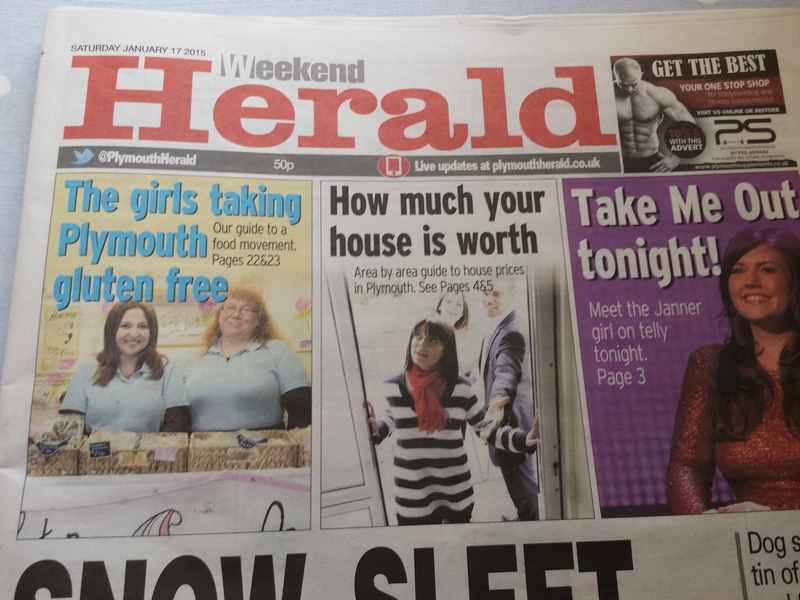 The Herald have today covered the opening of the new stall and have included an interview with Donna and Sarah. 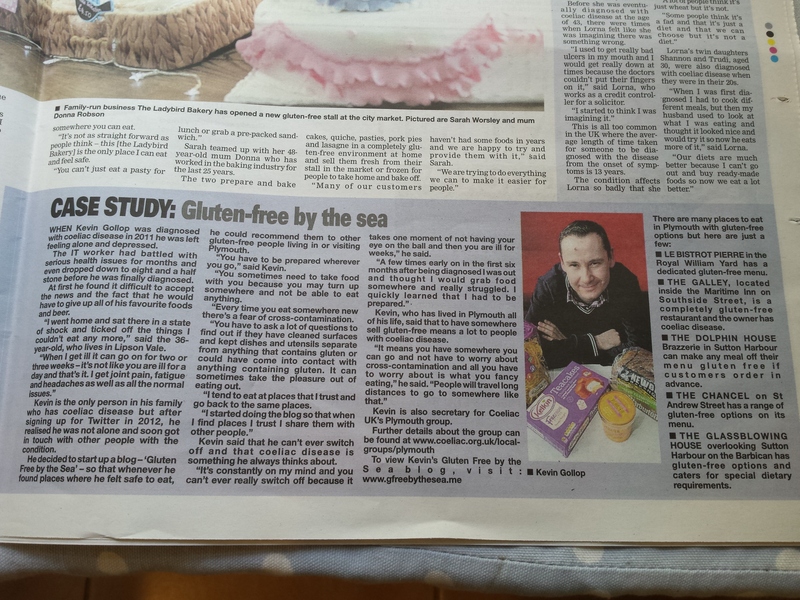 The good news is though that The Herald decided to take it a step further and have composed a feature on coeliac disease with case studies and have even featured an interview with myself about coeliac disease and Gluten Free by the Sea! A huge thank-you to Chiara Giordano at The Herald for her brilliant work on this. In addition to Chiara’s excellent feature, there was also a great review of The Galley by Louise Daniel and a gluten free pizza recipe in the What’s On section yesterday. The Herald have put much of the coverage on-line and you can read it here. Fantastic coverage and a big well done to all involved, and brilliant to see the Ladybird Bakery girls even making the front page! 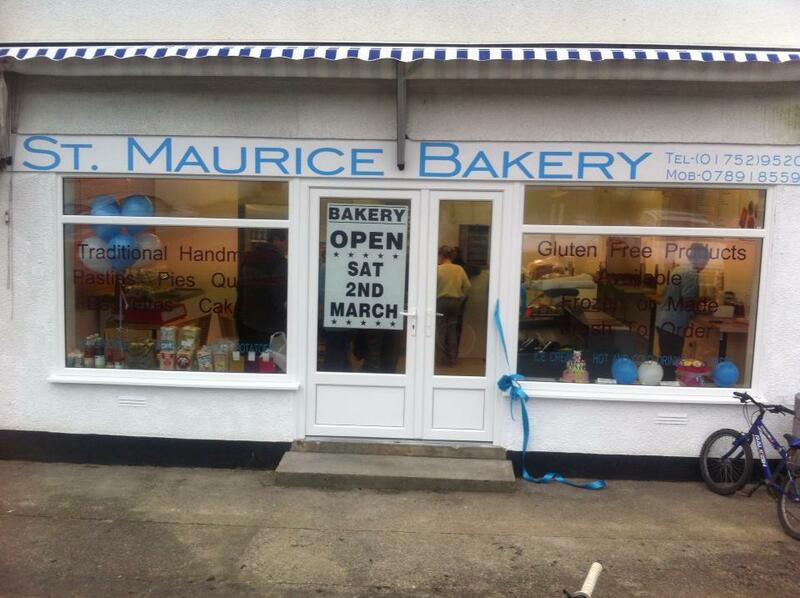 I recently posted about a gluten free event at St Maurice Bakery in Plympton, Plymouth. I’ve been meaning to do a follow up post for some time, but that’s been some what delayed by a trip to London for the Allergy and Free From Show and another to the North East to visit family and to take in a Bon Jovi concert. Since getting back to Plymouth I’ve been busy catching up on admin for the Coeliac UK Plymouth group, but have found time to enjoy some fabulous gluten free lunches at Le Bistrot Pierre and Bistro One. As for the event on the 1st June it was a great success. I was manning an information stand with my Coeliac UK Plymouth Group hat on, and also giving out some Gluten Free by the Sea business cards to spread the word. The event was really busy and I had a great time meeting and talking to Gluten Free by the Sea readers and members of the Plymouth Group, as well as other people looking for information. I was also close enough to watch Lai-Yin Wong Brooks gluten free Chinses cooking demo which was very popular, and of course snag some delicious tasters! I did abandon my post on a couple of occasions to take a look around the bakery and try some of the tasters that they had on offer. The sausage roll and quiche samples they had out were both really tasty. I particularly enjoyed the quiche and the quality of the sausage in the sausage rolls. 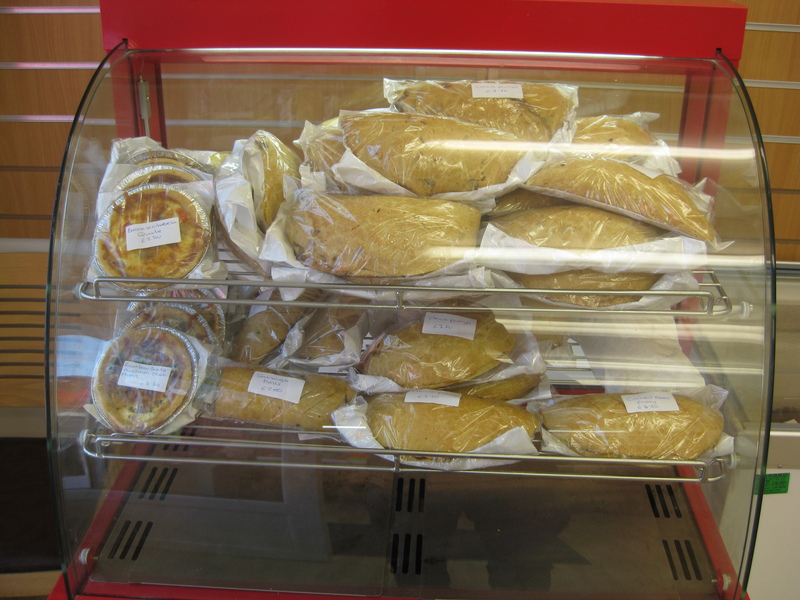 There were fresh gluten free items available to buy including steak pasties, sausage rolls and quiche. 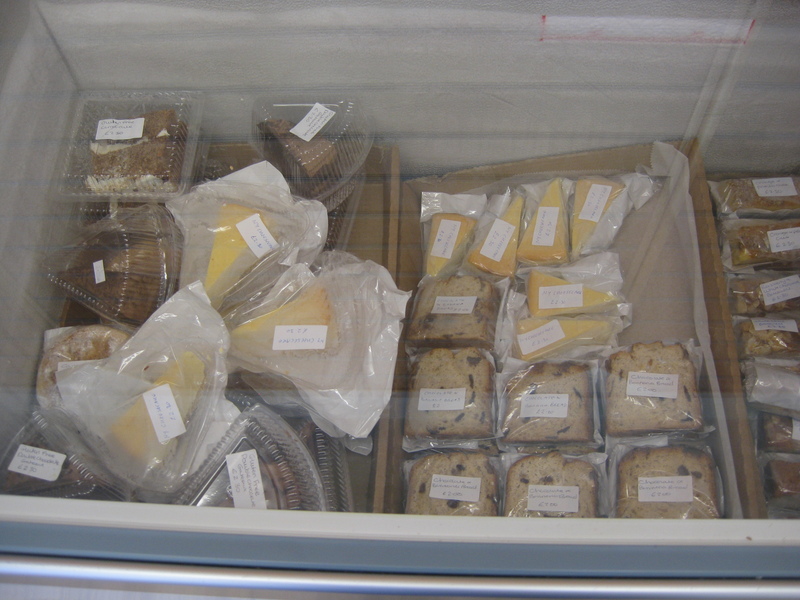 Frozen items available included New York cheesecake, chocolate cake, carrot cake, lemon and almond polenta cake, pasties, quiche and egg and bacon pie. 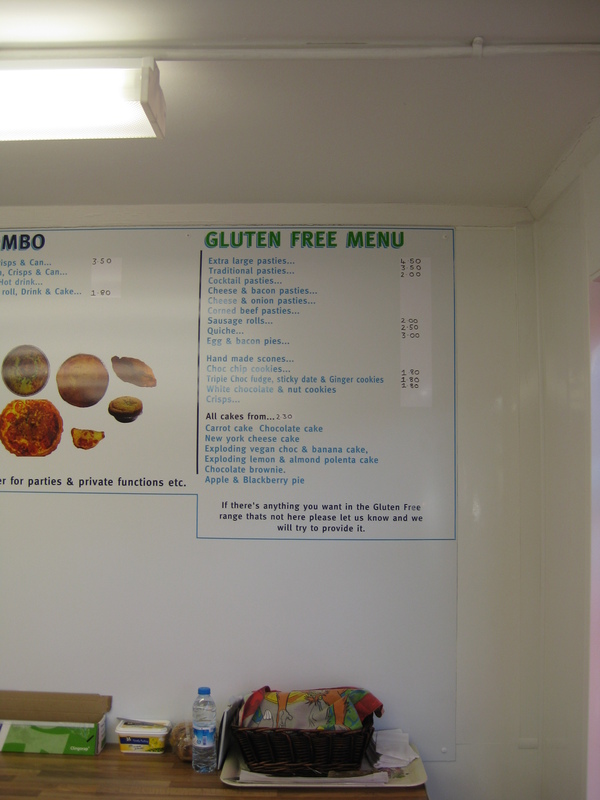 It was great to see such a prominent gluten free menu available in the shop, and the words gluten free very showing clearly in the shop window. 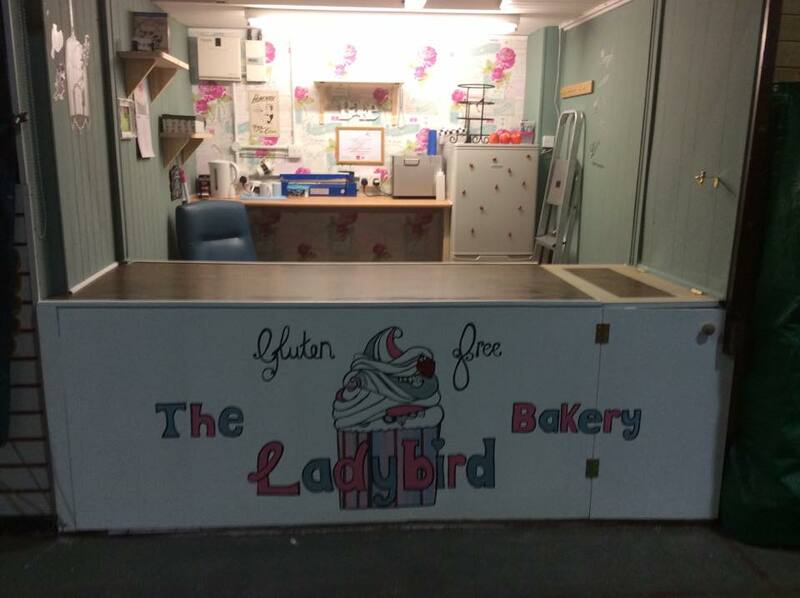 I took the chance to have a chat with Samantha and Roy Evans who run the bakery, and have a look behind the scenes. There was a separate area and oven where the gluten free items are produced, and the gluten free items are cooked on separate days to the regular items to avoid contamination. 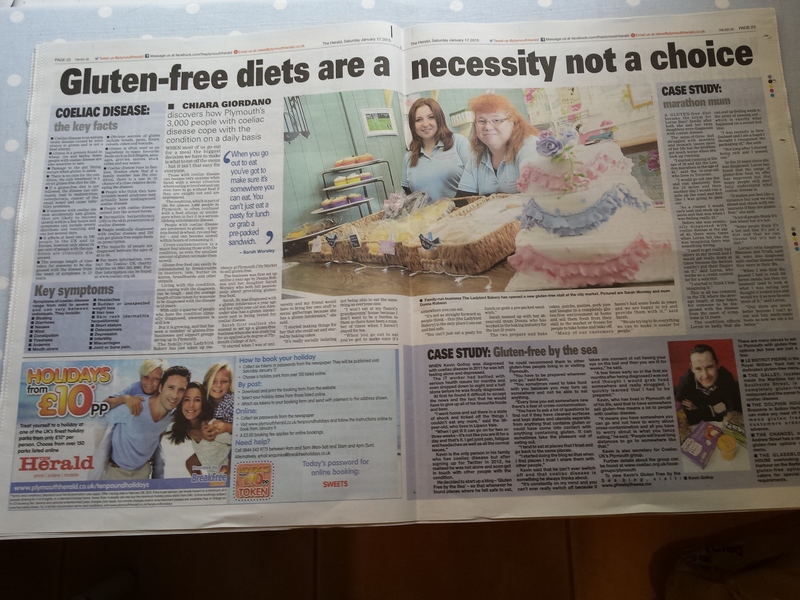 They are taking this further and are currently fitting out a new room which will be used solely for GF baking, and are also undergoing product testing so the items can be officially certified gluten free. I asked Roy what inspired them to start baking gluten free products and discovered it was a request from a gluten free friend. At the time they were running a shop called Hooe Pasties in Stoke, and the envious friend challenged Roy to come up with a pasty he could safely eat. The guys took up the challenge and everything has gone on from there. 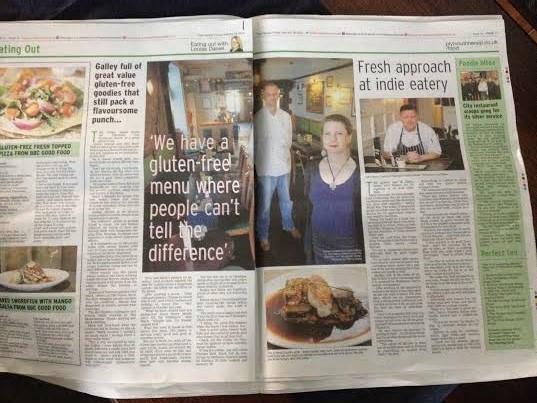 Roy and Sam have clearly developed a passion for their gluten free products which is great to see. They are keen to develop new products and are investigating fresh bread and I told Roy I’d love to see a GF doughnut! The event was held on a beautiful sunny day and for the first time as a coeliac I had the chance to buy a warm pasty to go with it. I’ve found GF pasties, but gluten free ones are usually only available frozen. To sit outside the bakery in the sun with a fresh warm pasty was a bit special. The pasty itself was full of great quality steak and was really well seasoned, just how I like it. 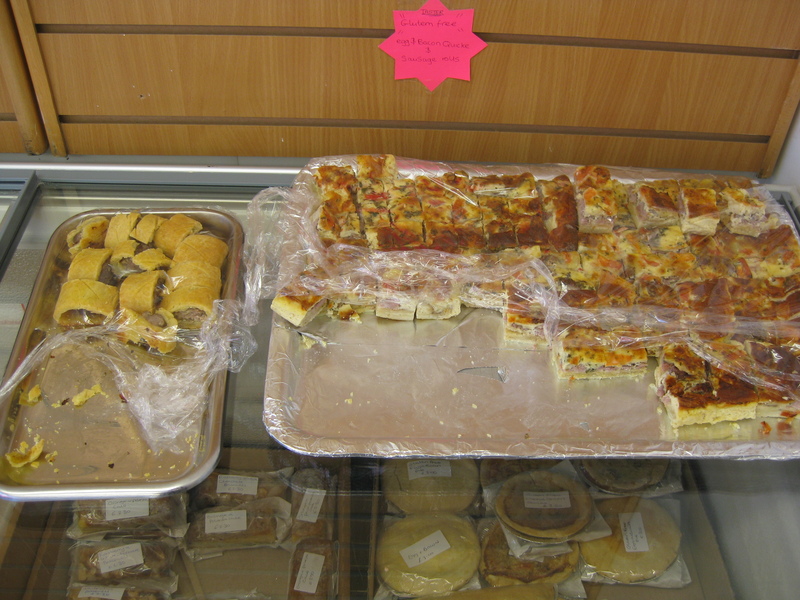 I also bought some lemon polenta cake, New York Cheesecake and an egg and bacon pie to take away with me. These were all really nice, and I particularly enjoyed the really moist polenta cake. The bakery have fresh baked gluten free goods available on the first Saturday of every month, with frozen products available until the next gluten free bake day. July 6th will be the next day when fresh baked goods are available. You can contact the bakery on 01752 952079 or 07891 855950 if you have any queries or would would like to order anything. I can recommend a visit to check them out. There is a gluten free event taking place this Saturday at St Maurice Bakery in Plympton, Plymouth. Coeliac UK Plymouth Voluntary Support Group Organiser Lai-Yin Wong Brooks (right) will be there in a personal capacity, demonstrating cooking gluten free Chinese dishes with her company 8. The bakery is run by Sam Evans who has recently opened in Plympton after previously running Hooe Pasties in Stoke. The Coeliac UK Plymouth Voluntary Support Group are also going to be present with an information stand and offering advice to coeliacs. I’m personally looking forward to the event as I’ve been meaning to check out Sam’s gluten free baked goods for some time now. I’ll also be manning the Plymouth Group stand for a while, so do come and say hello! For full details of the event and some of the goodies on offer see information below. Sam Evans, Owner of St Maurice Bakery will have freshly baked Gluten Free items. There will be samples for people to try & available for purchase. 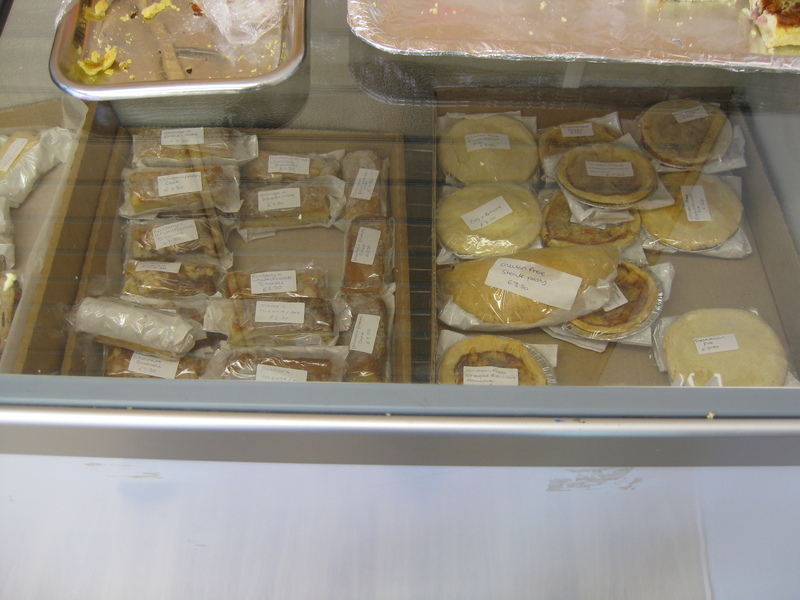 Some of the Gluten Free items stocked here include a variety of pasties, sausage rolls, quiches, egg & bacon pies, scones. A variety of Gluten Free desserts are available for anyone with a sweet tooth which includes carrot cake, chocolate cake, New York Cheese Cake, Exploding Vegan choc & banana cake, Exploding lemon & almond polenta cake, chocolate brownie, apple & blackberry pie. 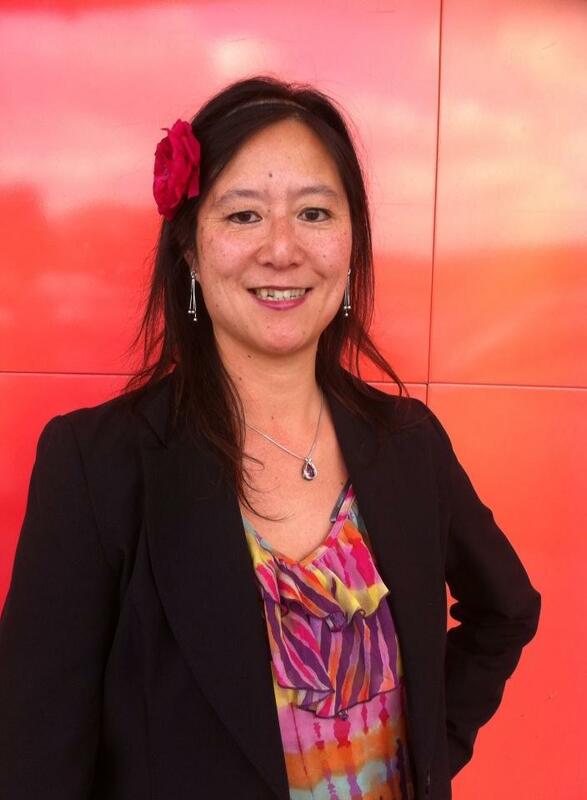 Lai-Yin Wong Brooks, founder of 8 will be demonstrating some Chinese Gluten Free recipes between 10am-2pm. Advice will be given on what sauces can be used to create these dishes. Items will be available for purchase & specific orders can be placed for delivery. The Coeliac UK Plymouth Group will be there to offer advice and will have some information literature available.